A blog about finding balance in your life, connecting with who you are, and creating a lifestyle where you wake up each morning eagerly anticipating the day ahead. Sixteen years ago my husband and I were still spending most of our time at work running a thriving business we had created. Financially everything was great… the store we owned and operated was in a wonderful location, it was an attractive and newly renovated space, and the comfortable, extra large office made our store feel that it was “almost” a home away from home for our entire family. Unfortunately, our success meant we had little time or energy left for anything other than the business… and it was obvious that we never were going to have that time and the freedom we yearned for as long as we had the store. Still, letting go of the store was almost unthinkable because we had worked so hard to get to where we were. But life doesn’t stand still. One day we received a certified letter notifying us that our very likable, but rather disorganized landlord was being forced to file for bankruptcy and that the entire plaza would soon be sold at auction. A few anxious weeks later we learned that the new owner intended to completely renovate all the stores (again) and that demolition and construction would start immediately. And it did. A crew of carpenters moved throughout the plaza, ripping out walls and changing the location of doors and windows, with the person directing the action often changing his mind in mid-operation. We discovered that this person had a violent temper and that it was better to keep out of his way. We saw him in horrible rages, sometimes losing control completely and screaming and throwing things at his crew. The chaos went on for weeks and weeks and then suddenly one day before anything was actually finished, we (and all the other tenants) received notice that finishing the renovation would now be the responsibility of each individual tenant. Materials would be furnished… labor would not. A terse statement at the end of the letter said that any tenants not liking that arrangement would be released from their leases and could leave immediately. Like the others, we really had no choice… we stayed because we had so much already invested in that location. It was now early summer and our busiest time of year, and the only time we could do the renovation work was nights and weekends. We worked on rebuilding our store all through the summer months. And then it was September and most of the stores were finally back to normal. Strangely, the couple who rented the store next to us finished their rebuilding the same day we did. They came into our store that Thursday afternoon and we spent over an hour commiserating with each other about what a terribly difficult time the last several months had been, and about how we all yearned to be able to spend more time at home and have a life outside of our workplace. I especially remember the woman’s enthusiasm and determination that this very day would be their first step towards a less harried life… they planned to close their store early, pick up their children at school, and have a relaxed family evening for the first time in months. That night as I was preparing our dinner with the television news on in the background, I was stunned to hear that this couple had been involved in a horrible accident less than forty-five minutes after they had left our store. The woman was killed immediately and the man was critically injured. All I could think about that night was that just a few hours earlier I had been listening to this woman’s plans for a future that now would never happen for them. For us, the accident was a sad reminder that sometimes there is no tomorrow. It was also the impetus we needed to make our plans and dreams for a less stressful life a reality. It was not an easy decision, and it still took us a few more months to plan out what we were going to do, but slightly over a year after that terrible night, and just days before we would have had to sign another ten year lease, we sold off the last of our merchandise, closed our store, and never looked back. Everyone who knew us thought we had lost our minds, because we are not normally impulsive people, and at the time we made the decision we had no other income. Everyone thought what we were doing was totally out of character for us, and it was, but we both felt strongly that we were doing the right thing. 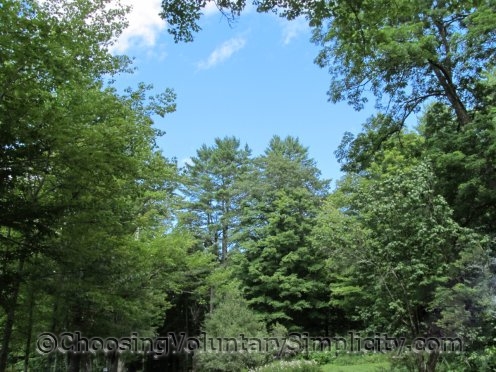 And because we had savings and were completely debt-free… and had completely paid off our mortgage and car loans and pared down our expenses as much as we could… we had already greatly simplified our life and made this change in lifestyle possible. We have no regrets. A few months after we closed the store, we started working from home, and that work has grown to provide us with a comfortable income. Our life has regained its balance, and our time is our own again. I only wish our friends could have lived to have the same opportunity. All comments are moderated... your email address will not be published. Boy, a friend sent me the link to this article and it couldn’t have come at a better time. I believe that God is telling my family something (through me reading this article) and we need to listen. Thank you for being so honest and open. I think this post reflects what a lot of folks think, when the get a moment to reflect. We all live such harried lives, it is difficult to step outside of that and evaluate your priorities. I’ve stumbled across this blog twice now and really like it. I spent some time reading about your hosta’s, being a slight hosta addict myself. My own philosophy is “voluntary simplicity” and boy does it work out well for me. I found this post very relevant to my own experience at the moment. I’ve recently embarked on a similar journey and I am glad to see I am not alone. Happiness is the freedom to enjoy your life on your own time, on your own terms with the people you love. It is the material that keeps a person from genuine freedom. Good luck and take care! it’s a powerful lesson to learn. When I was young, three of my friends died before we even turned 21. One left a baby behind. My husband and I decided that we would try our best to enjoy each day and not get up chasing money. We are still together 26 years later, and I still think of those friends often. I really enjoy your blog, you help to keep me inspired to stay the course I have set! thanks for sharing your experience! So sad to hear about your friends but a great reminder that we have this day to live and we know not much beyond that. Simplicity is freedom. I am working towards that with my family too. My father and his wife were planning great things for their retirement when she was killed in a car crash…a colleague had a couple of months to go before she retired when her and her husband were going to New Zealand but her husband had a stroke…these and your story really emphasise to me the necessity to do what you can when you can because you never know what the future will bring. Thank you for the inspirational, if sad, story and the reminder to follow your dreams as if every day might be your last. In reality, nobody can live like that every day, but we can at least move steadily in that direction and stop putting off our dreams for “one day”. Your story made my day. Thanks so much for sharing! This is so deeply personal. Totally moved and motivated by your story to be more appreciative of every minute of every day. Hello, I just found your blog this morning and I am so impressed. I started reading and now I can’t stop. Thank you so much for all your wonderful insight and wisdom. Great job! Thank you for that sobering reminder that we should live for today. My husband had been considering retirement for quite a while when he was released from his job. We had been waiting for everything to be just right, mainly to sell our house. But, the decision was made for us and, I have to say, it has been nice. My husband still wants to find something part time and I am optimistic about the future. Your blog is a real resource for us and we thank you! I just read your article and felt so inspired. I admire your insight and determination. My husband has been very ill for several months and is currently living in a Nursing Home. I feel completely overwhelmed and exhausted from struggleing with our business, plus my own career. I have a stronge faith and pray I can stay on the course to reach the simplicity in my life I desire. I am a therapist and believe in this value. Congratulations! My friends still marvel that I ‘moved down’ to a small home with so little square footage, my house could fit in most of their foyers! It was something my husband and I had planned when we first started out and I saw no reason to not do it. I’ve always worked from my home and have never been a collector, so my basic needs and wants are very easy to handle. Everything I have, I own. And, yet, this home has everything you would ever need. I’ve lost a husband, a son, and a daughter, so I understand the fragility of dreams and goals and refused to let my older years be held in the hands of the bankers. This is an excellent post. I think that too often we have those moments when we realize that life is fragile but they usually pass and we are back to our crazy, hurried lives. It’s wonderful that you and your family were able to take that lesson and turn it into a beautiful, new way of life. I can’t believe I just recently found your blog. I’ve been a fan of voluntary simplicity for a while and have been reading several blogs on the subject. But thus far I find yours the most helpful and your tips the most “doable”. Thanks for all the great info! Wow, what a thought-provoking story. How tragic for your friends…but wonderful that it brought some good in how you’ve chosen to live your lives. I’m trying to figure out the mechanics of down-shifting (less work, more life) because you are so right, time is short. Absolutely stunning story. If there ever was a reminder that life is short and can end or change in an instant, this is it. Choosing life over continuation was amazingly brave and empowering, but really the only choice you had if you wanted to get some control back. Posts like this remind me of why I choose to live simply and debt free. thanks for sharing! That is a sad but inspiring story. I hope you take comfort in knowing that your friends had already taken some pleasure in that future simply by dreaming it and making the choice to start living it. Not only that, but you were able to share in the joy of their future dreams, and help them to live it out in some small way before everything changed for them. Thank you for the blog, I am enjoying it. Congratulations on your great blog! I absolutely love it and the message you bring to your readers! Thank you for sharing this post with us. It’s great to hear that out of a tragedy, no matter how horrible, positive things can arise. Life is indeed a precious gift and it is wise to savor the time that we do have. No one knows what may come, but we must be grateful for here and now! If only more people realized this before it’s too late. Reading your article has made me realize that I have had some wonderful opportunities handed to me that I allowed to slide out of fear of failure. I truly want to be in business for myself and also be the only one to manage my finances. I feel this pressure on my heart to do this. One day I’ll have no more tomorrows, so I want to make here and now count. Thank you for your thoughtful, excellent article. Most of my life, I have lived the simple life. I have a dream to live in a small house in a small country town. There I would get into all that nature has to offer. Being single does brings some reservations about doing this. Maybe as you did, there will come a day when I have the courage to make that move. Thank you for the reminder of how fast times goes by and the importance of enjoying it. My husband and I have practiced living simply for 13 years now. At first, it was purely out of necessity. Now, we do it because it feels like home. I’m glad to have found your blog. I’ve enjoyed reading it. I usually dont leave comments, but for the first time I feel complelled to say something. Reading your story and the comments from the other readers has given me the courage and inspiration to move forward toward the goal of living a more simple life; I know it can be done. I can’t express the inter peace I feel from knowing I’m making the right chose. Thank you so much! I think it’s wonderful! Good for you and I hope many more people who are caught up in the never ending stressful web, get inspiration from your story! We are doing exactly the same thing, leaving at the end of July. I have explained what we are doing in my own blog. We have no other income but also no debt. We have decided to leave our rented farm home and move into our camper to tour across Canada. We’ll winter in south BC where it’s warm. We will work and workamp along the way. We have small personal businesses and hope these will be enough with our newly, much lowered, need for income. We are absolutely thrilled with the decision to simplify our lives and are very excited about starting our new adventure!! Sheryl, I know the feeling… Best wishes for your new adventure! Wow, what an amazing story; sad for your friends and still a very inspiring read. I’m so glad I stumbled upon this blog (searching for wood burning stoves). I’m sure I’ll spend time here daily. I appreciate this article. 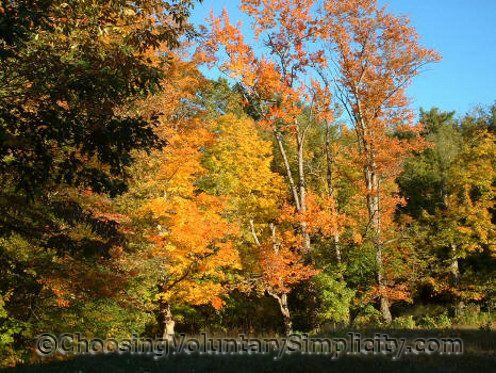 I’ve just found your blog this evening as our family is embarking on our Voluntary Simplicity journey. Thanks for this inspiring blog. I cannot wait to read more. When all else fails get a loving dog….you will feel good every time you look at him and he looks at you…or she. I found your blog when I was looking for the safe way to cook beans in a slow cooker. Thank you for sharing your story. It is the reminder I needed to make changes in my own life. A sincere thank you to everyone who supports this site by using my Amazon affiliate links and search box to purchase books and other items. What Do Bleeding Hearts Look Like When They First Come Up in the Spring? How Much Does It Cost to Feed YOUR Family? Still Want To Read More? 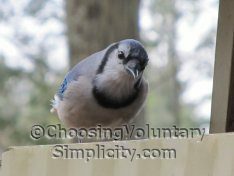 Check out the hundreds of other articles in the Choosing Voluntary Simplicity article archives.